After a long, frigid winter, spring is when everything starts to come back to life. Flowers begin blooming, wildlife appears, and even humans tend to get more energy with the longer days and sunnier skies. With this natural renewal, we often tend to feel a need to declutter. So with the windows open and the breeze flowing in, we sift through our closets and tidy our cabinets. From long lost items to missing documents, the startling effects of a spring cleaning frenzy may surprise you. The following are a few reasons that may get you scrubbing your place as well. If you’ve ever felt more relaxed while washing dishes or dusting the blinds, you know firsthand that cleaning is a natural way to de-stress. Clutter has been scientifically proven to be a trigger for stress, and a great way to solve the problem, while also relaxing is by cleaning. Even just 20 minutes of this activity has shown to help. Studies show that using lemon-scented cleaning products can help you feel better even faster. The happy smell of lemon can leave a positive impression on you and anyone that enters your home. For best results, avoid using chemicals and go for natural lemon – it’s safer for you and your pets. While you’re focused on getting the potato chip crumbs under the couch and the spider webs off the ceiling fan, all that bending and reaching can be a real workout! Things like scrubbing, vacuuming, and even folding laundry are all surprising ways to burn calories. Even better? Research has shown that there is a connection between a clean house and more physical activity in general. The self-regulation is a great way to drive your goals when it comes to a clean closet or running a mile. The American Heart Association is always suggesting that we get up and move more. In fact, sitting just 30 minutes less each day can make big improvements on your heart. What better way to get moving than by cleaning? Instead of sitting down and scrolling through Instagram, get up and vacuum, wash the windows, or rearrange your sock drawer. Do it for your heart! Spring cleaning can do wonders for your productivity outside of the home, too. You may find that you’re in such a good mood from a clean home, that your head is clearer when it comes to your workload at the office. You may also feel more motivated to tackle your messy desk at work or that filing cabinet that has decades of old files in it. Simply put, cleaning makes you want to clean more. There’s no stopping once you get started! Forget the sleeping pills! If you can’t sleep, get up and try tidying up your bedroom. According to the National Sleep Foundation, those who make their bed every day consistently sleep better, too. And those who have a clean bedroom and use lavender room spray enjoy better sleep and feel more rested when they wake up each day. That old tennis racket you no longer use or the bridesmaid dress you don’t want, could be donated to charity and make someone’s day. As they say, another person’s junk is another man’s treasure. You never know who may be looking for the very thing that you’ve been storing away, unused for years. Donating to charity is easier than ever as many charities offer free pickup. Going through your stuff could be liberating for you as you clear away space, while offering someone an opportunity to have something they may not have had otherwise. Ever stub your toe on something you meant to put back? Step on a LEGO? Trip over a pair of shoes that should have been in the closet? Cleaning up your living space can lessen your chances of injuries. It sounds crazy, but anyone who has ever fallen down the stairs because of clutter on them, knows exactly what we’re talking about. Spring cleaning can help keep you and your family out of the ER! Nobody wants to start the summer in a cast. Spring is already a huge source of allergies outside, so avoid allergens inside by cleaning away dust, grim, or (*gasp! *) mold that could be lurking indoors. You can significantly decrease your changes of getting sick by cleaning your house and removing harmful bacteria. Okay, so maybe not a real pirate’s treasure full of rubies and gold coins, but you never know what you’ll find when you dive deep into the depths of a closet that’s been ignored all winter. Pictures from spring break a decade ago? Your child’s drawings from preschool? Your birth certificate (does anyone actually know where theirs is?)? Another set of car keys? A book you’ve been meaning to read? A letter from an old friend you should probably call? The possibilities are endless because cleaning is like uncovering a plethora of discoveries you never realized you were missing. When you think of spring cleaning less like a chore and more like an adventure, who knows what you’ll find. After all your hard work cleaning out your closets, there’s no doubt you’ll make space for a few new things. 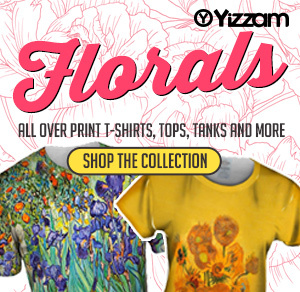 Our Spring Collection is just what you need to add a pop of color and fresh look to your wardrobe. Here are a few of our all over print favorites. The beauty of spring is up close and exquisite in this all over print top displaying a gorgeous rose bouquet. 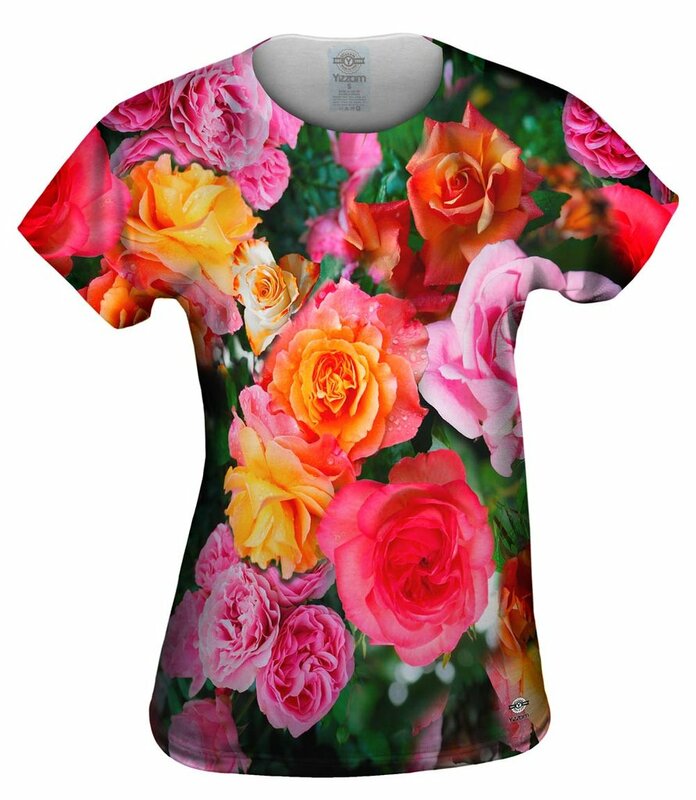 Just like a garden in May, this women’s top showcases colorful roses that almost look pretty enough to pick. Wear it with a skirt or favorite pair of jeans for the ultimate in spring fashion. Butterflies and these leggings are sure signs of spring. When it’s too hot for jeans and too cool for shorts, these comfortable leggings not only fit the scene, but fit the season too. They pair well with a t-shirt for brunch or a day out for a walk in the sunshine. 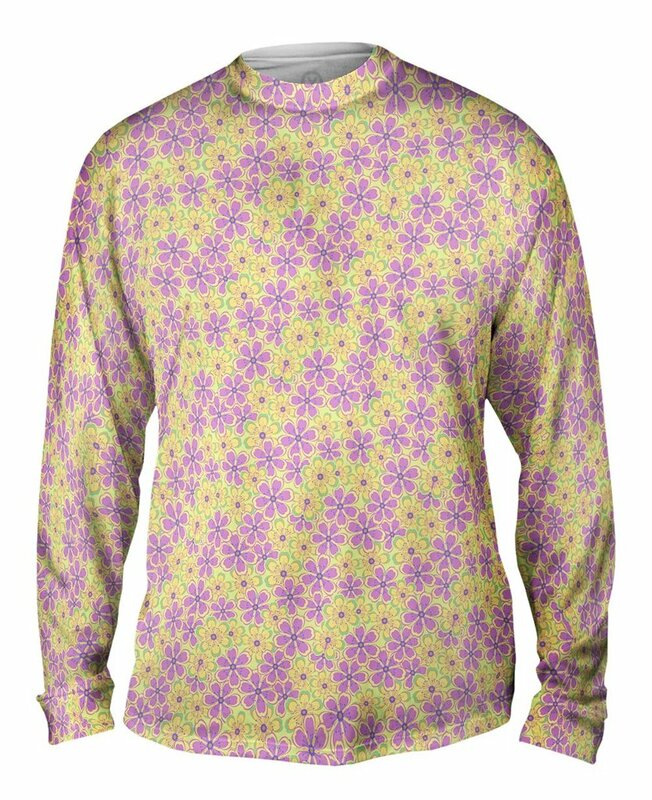 This subtle, all over print mens long sleeve top in pastel colors proves that even men love flowers. Go ahead an embrace the joys of spring in this comfortable and fashion forward top that goes with just about everything including your masculinity.